This week, Archaia Studios is giving old fans and new readers alike a chance to get familiar with one of the best-loved properties of the '80s with their release of "Fraggle Rock" #1, hitting shelves on Wednesday with a special Free Comic Book Day story on Saturday! We here at ComicsAlliance are looking forward to this, but since it's been a good 20 years since we've actually watched "Fraggle Rock," we thought a quick refresher course might be in order. That's why we got CA contributors Chris Sims and David Uzumeri to take us through the hole in Doc's wall, way back down to Fraggle Rock (clap clap)! Chris: David, in the time that we've been working together, we've taken on Pokemon, swimsuit specials, gender-swapped fan-art and more, but we've never had something that's actually caused childhood trauma. Until now. David: When I was a wee lad in the urban jungles of Troy, New York, there were two things that caused me to run screaming from the room: commercials for the cereal "Os" and "Fraggle Rock." As best as I can guess, it must be caused by some sort of deep-seated claustrophobia of the caves or something -- I loved Sesame Street, so it can't be a fear of Muppets. Honestly, I can't explain why, but "Fraggle Rock" scared the crap out of me. So today, with the help of Chris Sims and my therapist, I'm going to face my childhood fears as an adult. BRING IT ON, FRAGGLES. Chris: I, on the other hand LOVED "Fraggle Rock." Had the dolls, the books, watched every episode, the whole deal. David: Chris, you are the Virgil to my Dante on this one. Chris: I will guide you. 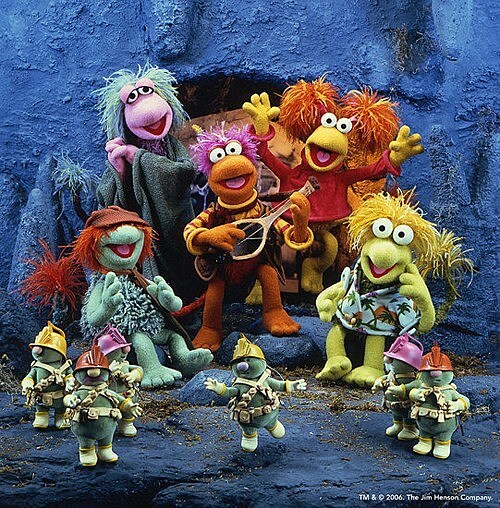 Chris: For our readers who, like David, were too terrified to actually watch the show, "Fraggle Rock" was a Jim Henson series that aired on HBO back in the '80s, centered on Fraggles, a bunch of fuzzy, highly licensable creatures who lived in an underground civilization and spent their time eating radishes and hassling lesser beings. It was a little more complex than "Sesame Street" in that it presented a lot of moral lessons through allegory, but it was still very fun and adventurous for kids, which of course has lent it credence in today's competitive ironic t-shirt market. David: It was on HBO?!?!? David: That just blew my mind. The only show I know of on HBO at the time was "Dream On," because it was the one you watched when your parents were sleeping and you were staying up in the hotel suite. David: Actually, it turns out it aired on CBC up here in Canada, which is why I thought it was public broadcasting. BECAUSE IT WAS FOR US! HAHA! The country where my tax money went to funding "Trailer Park Boys." I love this nation. 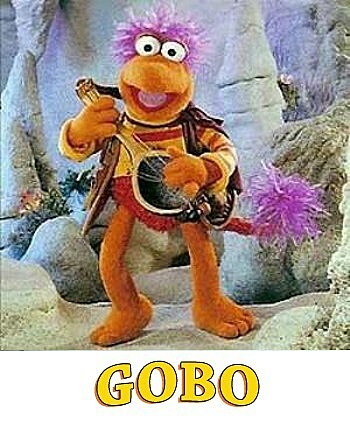 Chris: Gobo is the de facto leader of the Fraggles, and he's a pretty cool dude, as you can tell by the sweet leather vest that he's wearing. I have to admit, though, it's a little disconcerting seeing his feet after all these years of Muppetry. David: That vest has so many pouches it could be a Liefeld design. There we are: ROB LIEFELD'S FRAGGLES, a way to transfer my childhood illogical fear to children everywhere. Chris: He is basically dressed exactly like a guy who used to shop at the store where I worked, except that every one of that guy's vest pouches contained a Warhammer novel. Also, the customer in question wore pants. David: That's a relief, but the opposite would not be totally unexpected. Chris: Also, Gobo doesn't have a neckbeard. But once you start making comparisons, that fuzzy undercarriage Gobo's rocking there becomes more and more disturbing. I'm starting to see your point. David: It looks like a friggin' merkin, dude. And his tail is a frayed rope. I feel like I should light it, and then he'll blow up. Chris: One entry into this and you're already Fraggicidal. This does not bode well. 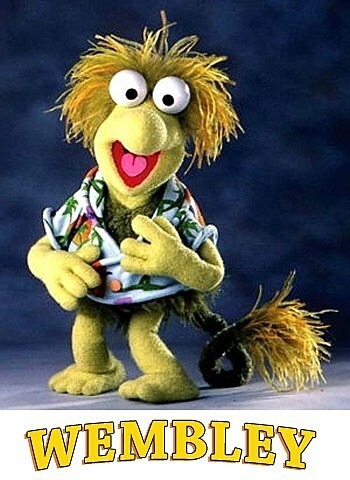 David: The fact that you interpreted that as Fraggicidal is disturbing. I don't have anything against Fraggles, man. My best friend is a Fraggle, I swear. I in no way have a secret group meeting in my basement that goes out on the weekends and curbstomps Fraggles. Chris: ... right. Anyway, one important thing to note here is that he's holding a postcard from his uncle, Traveling Matt, who would send him letters from his secret journeys out in the human world. So you see, David... there are Fraggles among us even now. David: So this was like a children's version of Postcards From the Edge? I saw that as a kid. So wait, there were humans in the Fraggle world? The Fraggles had to hide themselves away? How small were they, relative to humans? Chris: About a foot tall or so. They lived underground and got out through a hole in the wall of an old dude's workshop. But don't worry, we're getting to Fraggle Cosmology in a second, and seriously? You're gonna want to buckle up for it. David: Oh man, I'm pretty excited. Chris: Red was sort of the second-in-command in the Fraggle Hierarchy, and was involved in a constant power struggle with Gobo. It's, uh, more friendly and fun than it sounds. David: Do fraggles have gender? Red looks somewhat female. Chris: Yeah, she's a girl Fraggle. 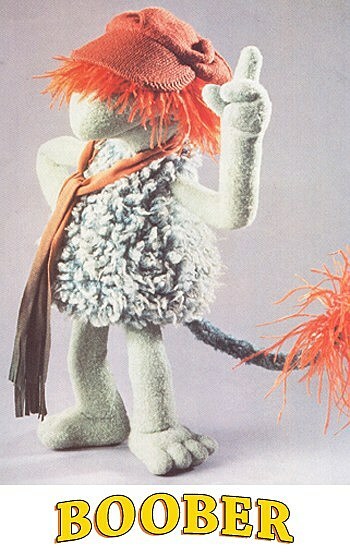 Or Fragglette. David: Fraggalos and Fraggalettes, prepare for some miracles! Chris: In all seriousness, I'm constantly amazed at how much expression Henson & Co. were able to put into Muppets, even when they had basically no features. Red's just eyes and a mouth with two pom-poms stuck on it. Much like the cast of "Bring It On 4." David: Well, I was immediately able to infer gender, you know? And I would absolutely never disagree with that assertion; there's a reason the Muppets are so iconic at this point, you know? Muppets were created to be child-friendly imitations of people, and now you hear people described as Muppetesque. Chris: Red's likes include swimming and other athletics. Like all Fraggles, her dislikes include pants. David: Do they all have those raging bushes and wicklike tails? Chris: Yep. That's how Fraggles roll. David: Is she sort of the chipper one? Or are they all chipper? Chris: She is! But they're definitely not all chipper, as we're about to see. David: They had a Timothy Leary? He's even got psychedelic hair. David: Oh, it's like a cat lady! Seriously, she looks like the Fraggle equivalent of the old lady down the street who rolls around rotting garbage in a dolly looking like a picture from the Great Depression chapter of my high school history book. Or the Soviet Union section. Chris: Sort of. As you can tell by her half-lidded eyes and Lebowskian bathrobe, Mokey's the dreamy, spiritual sort. Sort of like Phoebe from "Friends," but without the embarrassment of having been in two episodes of "Father of the Pride." 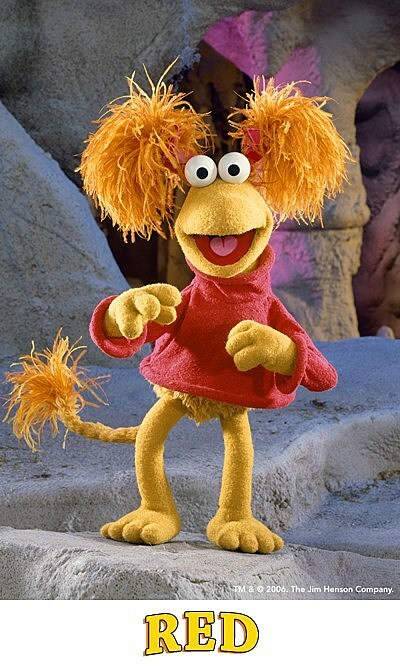 She's basically a Fraggle Hippie, and she's Red's roommate. David: Oh man, I knew those kinds of pairings in college. Chris: Yeah, no kidding. This is the first time I've looked back on "Fraggle Rock" in years, and I'm finding myself legitimately surprised that Mokey/Red didn't rise to displace Peppermint Patty/Marcy as the hipster's go-to closeted lesbian couple of choice. David: But seriously, I love how she even has mystic wanderer/crazy old lady robes. Did she dye her hair? 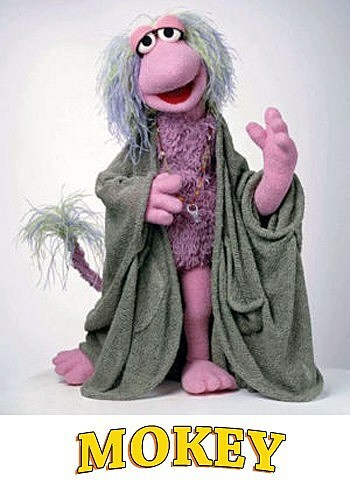 Every other Fraggle seems to match drapes and carpet. Chris Wembley: Fraggle Tweaker. Wembley's defining characteristic was that he was really indecisive and worried about letting people down. So basically he's super-neurotic and paranoid, although to be fair, he does rock that Hawaiian shirt like a champ. David: He looks like Jeff Spicoli. That really kind of encapsulates almost everything i have to say right there: I could totally see Wembley from "Fraggle Rock" playing that role all throughout "Fast Times." David: Kenny! Also, is Boober flipping the bird there? This is a pretty cool design, honestly. Did we ever see his/her face? 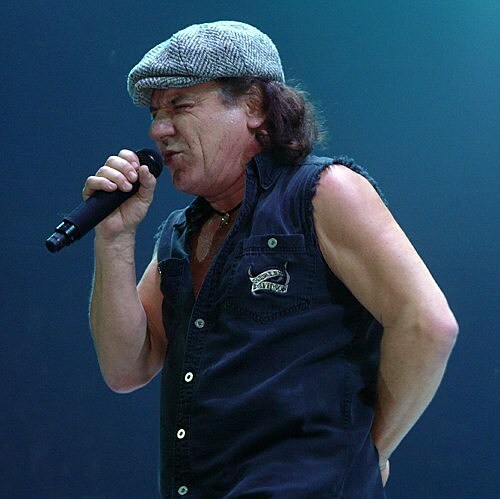 Chris: If you've ever wondered how much power Jim Henson wielded in the 1980s, here's the answer: That dude straight up went to TV and said "Hey, I'm going to make a muppet that looks exactly like Brian Johnson from AC/DC, call him Boober, and you're going to pay me to do it." David: Oh man, that didn't click. You're completely right. 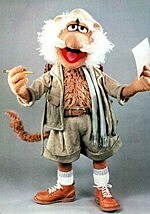 Chris: Boober's actually the depressed Fraggle. His favorite activity, I kid you not, is washing socks, and he's the only one who lives alone. Chris: I guess he still hasn't gotten over Bonn Scott's death. Chris: Okay, so you remember how I told you the Fraggles had a weird cosmology? Chris: The Gorgs. A family of 20-foot tall monsters who live outside (?!) in a run-down castle and grow radishes. David: Do the Fraggles, like, protect the humans from the Gorgs? 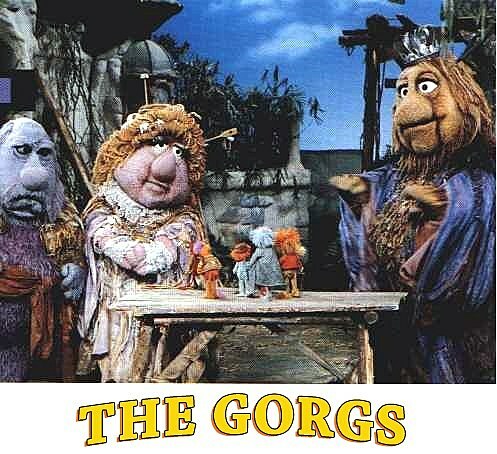 Chris: No, the Gorgs just pretty much hang out. The Fraggles have a Peter Rabbit sort of relationship with them where they're always stealing from the Gorgs' garden. They are, as far as I know, the only three Gorgs in existence, hence their status as royalty. Although in the last episode -- and I am not kidding -- Junior becomes king and abdicates the throne, abolishing the monarchy in favor of Fraggle-inspired socialism. David: Holy crap, what? When was this -- the late 80s? David: I mean, are we just talking a sort of vague socialism or Bolshevik-red? Chris: Well it's never elaborated on, but I think it's safe to say that Junior Gorg didn't set up Stalinesque purges. David: And who were the other Gorgs? Chris: His mom and dad. David: Wait, so there were only three, but one of them was king? How was there something socialist with three people? I mean, granted, three large muppet people. "As the series progresses, we learn that at the beginning of time a god-like character placed the Gorgs to rule over the universe until he returned." They have been ordained as the rulers of the world by the divine right of kings. It's Gorgifest Destiny. David: Holy crap! That's completely amazing, honestly, it makes me want to watch the show and makes me hate the fact that I didn't as a kid. 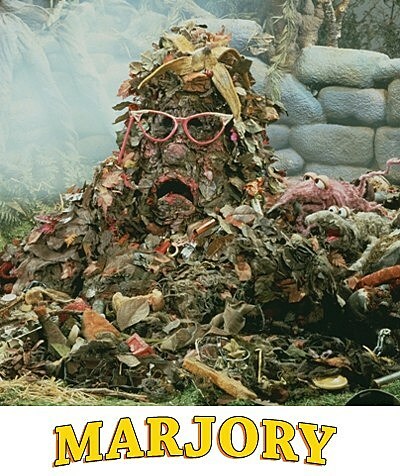 Chris: Even stranger is the fact that the Gorgs had a talking trash heap named Marjory. David: ...is that their grandma? Maybe when Gorgs die, they become composted, and sometimes regain sentience while in that form? Or am I totally overthinking a talking trash heap? Chris: I think that actually makes a lot of sense. David: I mean, those are TOTAL grandma glasses. They look like Philippe's Mom from Achewood wears them. Chris: I have vivid memories of the episode where the Trash Heap was suddenly changed around and got a new voice and everybody was flipping out and didn't trust her until they learned that sometimes, things change. David: It's really amazing that these were the kinds of shows that were all about raising responsible children in the D.A.R.E./War on Drugs era, yet there's really no other explanation for the vast majority of the ideas found therein. Chris: Did I mention that the Trash Heap can see the future? David: Honestly, I could interpret that fact in so many different ways. Is Henson saying trash is our future? The guide to our future? You've really convinced me that this is pretty layered, in terms of allegory. There must be tons of papers written on this stuff, considering a whole generation of kids grew up on it. Chris: She's basically the Oracle at Delphi, except made of trash. And attended by rats. And constantly being hassled by furry cave dwellers who favor vests to pants. And 20-foot tall monster kings. David: Isn't that basically the Oracle at Delphi? Chris: You have a very dim view of the Ancient Greeks, David. David: Look, if I learned anything from Frank Miller's "300," it's that Greece was all about rats, furry cave dwellers, lacking pants and 20-foot monster kings. Chris: We'll have to come back to whether or not you should be learning things from Frank Miller later, but now, it's time to round things out with a look at my favorite part of Fraggle Rock: The Doozers! 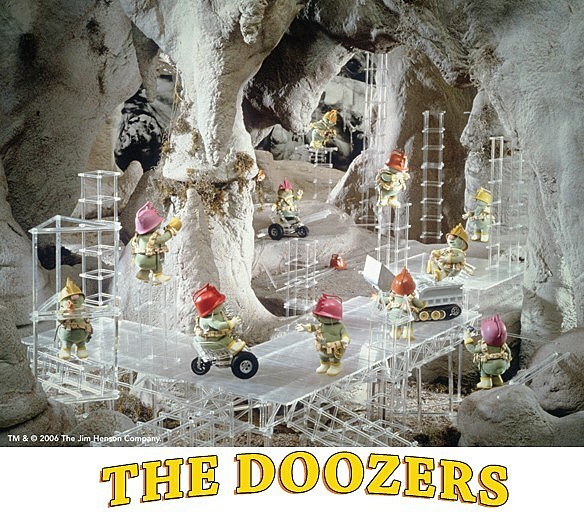 Chris: The Doozers were tiny little creatures that lived in the Fraggles' caves and formed a symbiotic relationship with them by building complex structures made of a crystal that was essentially radish candy, which the Fraggles would then gorge themselves on, destroying their work to sate their greed. David: Oh my God, those things are adorable. Chris: I know, right? I love that they wear toolbelts, hardhats, gloves and work boots, but don't actually bother with clothing. David: Also, that's incredibly depressing. Was that supposed to be a metaphor to man's inhumanity towards nature? I mean, it sounds like watching this as a kid, you'd think the Fraggles were kind of douchebags. Chris: Actually, it's less depressing than it sounds: The Doozers take joy in the building, not the finished product, so they're totally cool with the Fraggles eating their buildings. In one episode, Mokey feels bad for them and gets the Fraggles to stop, and they build so much that they run out of room and a Doozer mother tearfully explains to her son that they have to move because there's no work for them here. David: Holy crap, it's a classic creation/destruction its-the-journey-not-the-destination morality play. That's fantastic. Chris: It is! 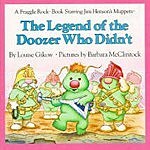 But here's the weirdest bit: When I was a kid, I had a book called "The Doozer Who Didn't," which was basically a Doozer bedtime story. In it, one of the Doozers just straight up quits his life of endless, thankless toil and starts lazing around all the time. And here's the weird part: By quitting his work, he slowly evolves into a Fraggle. It's the Doozer creation myth. David: WHOA. Does he stay on the show from there on out? That actually just blew my mind. Chris: Sadly, it was just in the book. So have we conquered your childhood fears? David: With aplomb! This last hour has exponentially increased my respect for "Fraggle Rock," both as an entertainment vehicle and a didactic tool. Honestly, this has me wanting to track some down, even as an almost-26-year-old adult, at least to show to my hypothetical children. Or to use that as a justification for watching a children's show, because I'm insecure.